Snowstorms, holiday parties, and… your home sale? Winter may not seem like the obvious season to put your house on the market, but there are many reasons why it’s a great time of the year to do so. 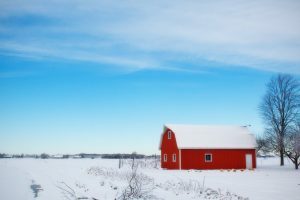 If you’re on the fence about whether or not to list your home now or wait until spring or summer, these six reasons to sell your house in the winter will help you make up your mind! Selling in the winter really weeds out the fluff. In spring and summer, when the weather is nice, open houses get a lot of window shoppers. These are people who aren’t serious about buying and only want to see what’s on the market or just kill a few hours over the weekend. Unfortunately, talking with them can take up valuable time and energy from you and your real estate agent that’s much better spent elsewhere. In the winter, these window shoppers go into hibernation and you can be sure that you’re only working with serious buyers. A 2015 report found that homes listed in the winter sell faster than those in the spring. If you’re trying to unload a house on a time crunch, this is the time to do it. With fewer houses on the market and more serious buyers, it makes sense that the best homes are snapped up quickly. This fast turnaround can save you a lot of money (no one wants to pay two mortgages) and headaches down the road. It’s not very hard to make your home feel welcoming in the winter. Compared to the ice and snow outside, your house is already looking pretty good to potential buyers! Outdoors, you can also save money on curb appeal when you sell in the winter. In the spring and summer, you might need a fresh coat of paint, professional landscaping, and more to stand out from the crowded market. But in the winter, some nice outdoor lighting twinkling in the snow is enough to do the trick and takes almost zero effort on your part. When you sell your house in the spring or summer, you’re like a student in a crowded classroom. If you sell in the winter, the situation becomes more like one-on-one tutoring. In the low season, your real estate agent has more time and energy to dedicate to you and your house. Plus, they’ll be more motivated to sell so you’re likely to get their best effort. Lenders, lawyers, and everyone else involved in the process will have shorter wait times when scheduling appointments as well, all of which helps speed up the process and simply make it more pleasant from start to finish. Dave Ramsey reports that there’s “15% less competition on the market if you list your home during the winter,” so if you’re not in a hurry to sell your house, you’re in luck. When you put it on the market in the winter the lack of competition from other homes in the area can translate into a serious payday for you. You can list your property for a higher price than you may feel comfortable with in the spring or summer because even an average home can stand out from the crowd and command attention (or even a bidding war) during the winter months. There are many external factors that motivate buyers in the winter months. HR Magazine reports that January is “the most popular month for job changes.” If these employees have kids, chances are they want to move quickly to get them enrolled in school before the holidays end. In addition, people may be looking for tax breaks before the year ends or putting their annual bonuses to good use. All of this collides to make for a lively market that’s definitely ready to buy! Selling in the winter can come with a lot of benefits. Your property can sell faster and make more money. In addition, the process runs smoother during the low season when everyone in real estate has more time to focus on you and your home. Managing your staging and curb appeal is easier this time of year and you’ll only be dealing with serious buyers who are ready to make a move. All of this combines to make winter a lesser known but still ideal time to put your home on the market. So, what are you waiting for? Call The Degnan Group today to get started today!